Barberry, bayberry, and dried oregano flowers. I don’t know the cultivars of any of these; the previous owners planted the garden here, and I just try to keep it up as best I can. 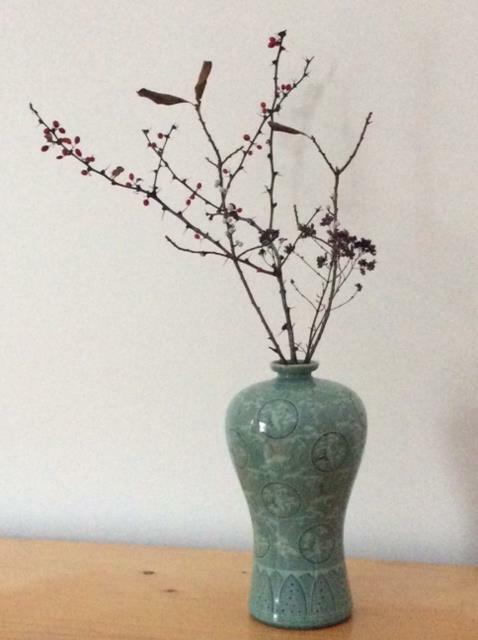 The vase was a present from a Korean graduate student, some twenty years ago, and I’m pleased I was able to find it when so many of our things are packed up in hopes of selling the house and moving somewhere smaller, newer, and more manageable. 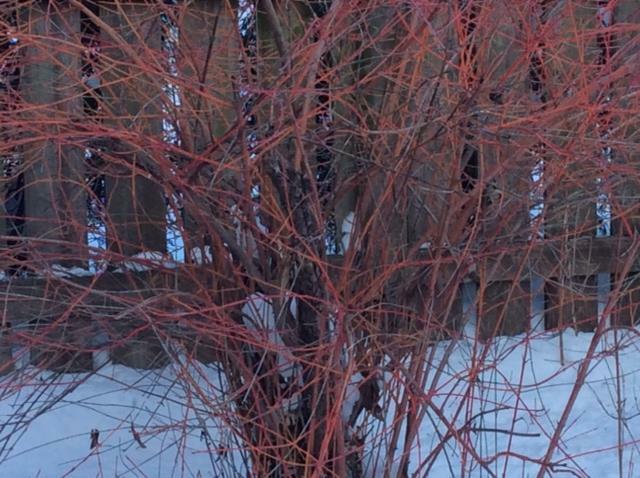 I just spent an hour and a half shoveling snow—we did get snow, after all, so I’m at home rather than on campus—and contemplating the winter remains of the garden as I worked. I had thought that this might be the only Vase post for weeks if not months, but I think I may be able to pull together one more winter vase. Any readers who miss snow and four seasons, I will happily swap places with you. Misery loves company, especially company from a climate I envy. Could I have some with not so much grumpy in it? I have lost a stripy scarf I’m fond of. There is a great deal of snow on the ground. The house has settled a bit more so there are more cracks in the ceiling (we were hoping to sell it before any more settling happened). Sir John has had an infection that could have been serious (fortunately he is responding to antibiotics and all is well, hence I am merely grumpy about this and not freaking out). We’re a little under-equipped for being snowed in, due to his illness and me not getting the right things at the store, which happened because I was distracted by the first week of classes and having to finish off final edits to the revised introduction to the Big Honking Translation (okay, yay that that’s done). Lady Maud’s father has entered hospice care, which is sad though he has had a good life and people are rallying around because he is a wonderful, loving and beloved man (a great contrast to my father, the old grouch). The son of a friend of Sir John’s has been diagnosed with cancer. This child is still in single digits. I feel guilty feeling grumpy about my scarf (let’s just say I’m displacing my distress) when 2019 is already sucking very hard for a couple of sets of friends. The nicest thing this week was reading The Dalemark Quartet, which I got for Christmas and finally broke out. But the downside to that is that now there is no more Diana Wynne Jones that I have not read. I put off Dalemark for years, so that there would still be something. I’m trying to persuade myself to do some work rather than getting out Rotherweird, which I got in London, intending it for the plane, but then our over-seat lights didn’t work so I spent the flight working on my laptop (and got quite a bit of useful course prep done as well as saving the book, so ill winds etc).